The team at Paradise Sun Hotel celebrates local Creole culture by providing their guests with an Authentic Creole experience. From the Creole cuisine served in their restaurant to the activities guests can enjoy. Nature walks introducing the flora and fauna of Praslin Island while pointing out traditional medicinal plants, guided visits to the village and their Creole House showing how Seychellois have lived, past and present, all invite visitors to personally experience 'creolity'. Every Friday is dedicated to Creole culture, and is the most popular day of the week with the interaction between the hotel team and hotel guests to highlight Creole culture and traditions. 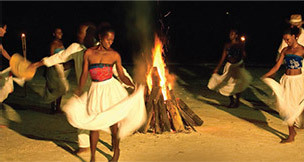 Guests can also gain knowledge and experience Creole cuisine by attending the hotel's cooking classes, learn how to make hats out of coconut leaves through their coconut demonstration and dance around the bonfire to the music with their traditional "moutya" and "Sega" demonstrations, and the Creole buffet presents local delicacies from starters to desserts.